From New York to Miami, Chefs Andrew Carmellini, Josh Pickard and Luke Ostrom, have taken their New York based hotspot to the sun soaked sand filled South Beach. Situated in the W South Beach Hotel and Residences, The Dutch still holds its position as one of the hottest spots in SoBe with its entertaining party vibe and extravagant food all in one jazzed up bundle. 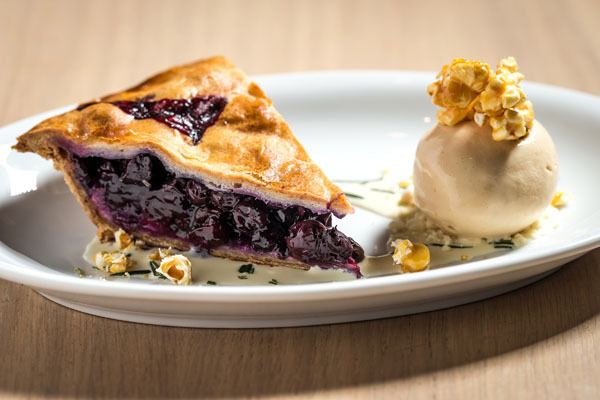 Known for the classic American fare, the talented trio revamped parts of the menu to offer a South Beach flair in order to attract diners who want a taste of New York, but don’t want to stray too far from home. 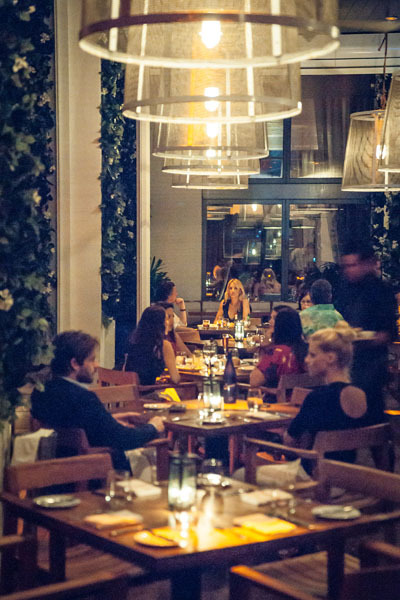 The Dutch offers a trendy addition to South Beach with its vivacious décor, offering warm lighting, comfort and style. The long rectangular space is broken up into more intimate areas by thick white brick columns. The contrast between the light sand wood color and darker blue tones paint a very detailed picture of the beach in all its beauty and elegance. The added light fixtures, and other elements provide a contemporary rustic chic style, which agrees with the style of the menu. The New York element is detected which seamlessly blends well with the Miami South Beach aesthetic to maintain that perfect balance of whimsy and class. 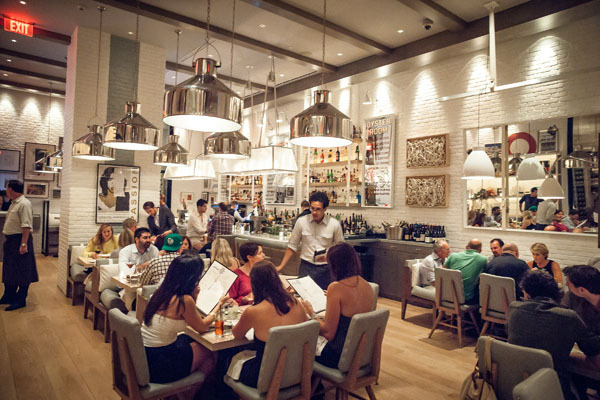 The dining room is flanked by a bustling bar stands at one end with a marble seafood bar at the other. The outside patio introduces the green shrubbery found before you land on the beach, and displays a rainforest type environment with clean contrasts between wood and plants and the soft glowing lanterns adds a seducing element for a pleasant evening out. 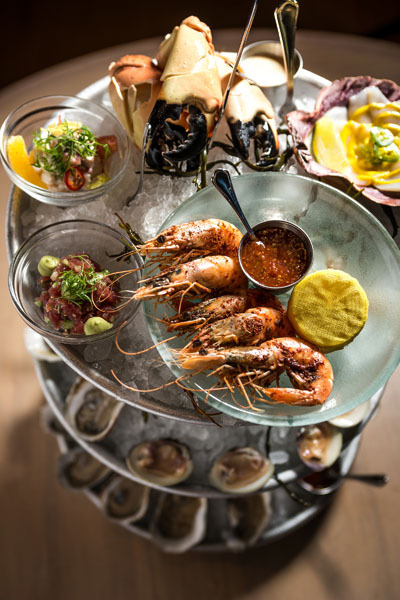 To begin your dining experience, the oyster room offers a selection of fresh seafood options including four varieties of fresh oysters, stone crabs, shrimp and American caviar. The Asian White Boy Ribs are a mouthwatering starter—a tender juicy pork rib embodied in a unique sweet glaze that will keep you held over until the main event. For the signature dish, try the bone in prime NY strip with dressed greens—which is simply divine. 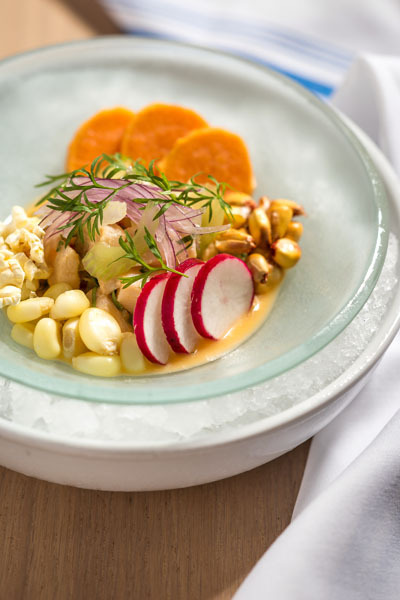 If you’re in the mood for seafood, look no further than the red snapper “Moqueca” with spiced lobster broth and Xuxu slaw to take advantage of the fresh seafood bounty South Florida has to offer. Other notable dishes include an array of pastas, such as spaghetti, with manila clams and Spanish chorizo or the pappardelle, lamb ragu and sheep’s milk ricotta topped with mint. To top off a pleasant evening, indulge in the chocolate soufflé, with a hazelnut crunch and dulce de leche ice cream. The fresh pies are made daily and include a scrumptious banana cream pie or a classic salted lime pie. For a more polished finish, the plate of sheep, goat and cow cheese from New Hampshire, Vermont and Virginia dairy farms reflect America’s artisanal roots, which is the spirit of The Dutch. The beverage menu includes a lengthy list of American Bourbons, ryes and craft beers as well as potent cocktails including the all-important margarita. For sharpness and class, the extensive global wine list covers cutting-edge boutique labels, distinguished grand crus and some interesting reds and whites.